LINPICO has been implementing the EU-Ethiopia Technical Cooperation project since 2012. The project aims to strengthen aid cooperation mechanisms in order to enhance the coordination of EU external assistance, including by supporting preparation of projects, joint annual reports, EU+ cooperation, Aid effectiveness and Monitoring including JROM. Besides all treaties, agreements and procedures the main thing that counts in the collaboration of the European Delegation (EUD) and the National Authorisation Office (NAO) are “people”. The better they know each other the better the results of collaboration. 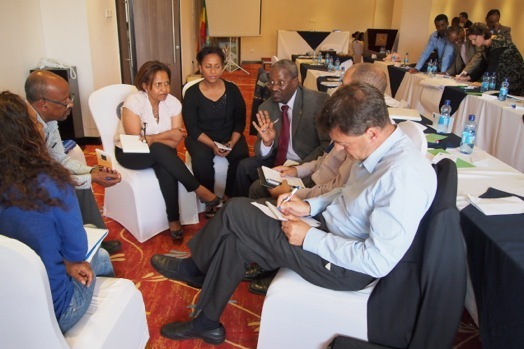 This was the idea behind the first ever team-building event of the EUD and NAO at beginning of June in Addis Ababa. Forty-two members of the two organisations met to discuss their daily work, collaboration and restraints. The team-building event was joined by the new Head of the European Union Delegation to Ethiopia, Ambassador Chantal Hebberecht and Ato (Mr) Belachew Beyene, Deputy National Authorizing Officer. Mixed working groups with members of the two organisations discussed challenges and opportunities of their daily work in the fields of rules and procedures, communication, issue of trust, triangle of decision taking (NAO, EUD, line ministries) and motivation. After a long working day the participants had smiles on their faces, all of them appreciated the chance to get in touch with their counterparts and to know each other better.